1. Pixar LOVES being held and snuggled. He almost falls asleep in my hand and loves being rubbed and snuggled. Currently I give him 2.5 hours of attention in the AM and then about 4 hours in the PM after I get home from work, and this is weekdays. I always start by holding him to let him have any touching and snuggling he wants, and then based on his reaction and behavior I may let him run around or just hang out in his cage while I do stuff in the apartment. Is this enough attention for him? On weekends he will obviously get a lot more but weekdays made me nervous as I read so much about how much interaction they need. I am also assuming due to his young age he may need more physical attention right now. Is this accurate? 2. Is he still considered a baby? He is obviously not a chick, but 1 year old seems like a young parrot. I can tell he has little tantrums if he doesn't get exactly what he wants but he is responding very well to gentle training. When he gets too hard with his beak I gently push the beak off my finger and use my chin to tuck him under my chin gently. He seems to understand that I am mommy and saying no, and this has really reduced the hard biting even in 3 days! I know they are "beaky" birds, and I am also assuming that based on his age he is even more so. 3. How long does it generally take a parrot to adjust to new surroundings and people? He has only been in the pet store before me, and I have had him since 1/21. He seems pretty comfortable with me so far. Thanks for any feedback you can provide to help me raise my little guy!! Hi. I have a green cheek. I also work at a parrot rescue and have a bit of bird experience. Greencheeks are pretty needy birds. They will always want to be with you, and will want a lot of attention. Lots of contact is okay, especially now, but be careful to only scratch and stroke him on his head, cheeks, and feet. Any other place can be sexually stimulating for a mature bird, and can lead to problems later on. Its sounds like you are giving him a lot of attention and including him as part of the family. A green cheek is they type of bird who will want to be involved in everything you do. Just don't let him outside, whether he is clipped, or not, make sure he is kept away from cooking and other heat dangers, and beware of things like open toilets and aquariums. Birds can drown easier than you'd think. Your bird is a juvenile, and as such he will adjust to you and your house pretty quickly. He will also adjust to new foods quickly, and you should take the opportunity to introduce him to fresh vegetables and fruits. Greencheeks are one of the easiest birds to covert to fresh foods, but earlier is better. Organic foods are better than non-organics. There are many threads around here about what is safe and what it not. Greencheeks mature at a young age, relative to other parrots. He will be entering puberty soon, and that come with challenges. Make sure you find, and establish a relationship with an AVIAN vet. You can't wait until a bird looks sick. A bird showing signs of illness is VERY sick. Have annual checkups. I'm sure the pet store told you he was all checked out and all healthy. Have your own vet repeat the exam. Post a picture when you get a chance. Knowing the exact type of bird might help with some specifics. If you tell us what state you are in, we can help you find an avian vet, if you don't already have one. Thanks so much for the great advice! I am in Richmond, VA, and have heard there is a great Avian vet locally, and will be looking her up soon. Pixar definitely likes to be stroked on the outside of his top feathers, and lifts up his wings for me to stroke his fuzzy underfluff. So this is bad? He loves this and burrows into my hand often, almost looking like he wants to fall asleep. I have also noticed several different vocalizations. He makes a loud squack if I leave the room, and I have heard that is his way of making sure I am still in his flock, lol. He also chirps, quacks when he is being snuggled, and just yesterday seemed to mimic me making a kissing noise. He did eat a grape yesterday, but showed no interest in spinach, banana, or an almond. I will try romaine lettuce, orange, and more grape. What kinds of trouble does puberty bring? Is there a way to know when he starts this? How long does it last? Do your green cheeks seem to want to bond to only one person, or everyone in the home? So is being away from home from 8-5 bad for him during weekdays? His cage has plenty of stimulation and he is next to a large window. Thanks again for the advice and I will post a picture soon. OK I am almost positive that my guy is a pineapple green cheek hybrid. He looks exactly like the pictures of them and I remember the salesman saying he was a pineapple hybrid conure. Does the hybrid nature matter? Any touching under the wings like that will be sexually stimulating once he is mature. It can lead to confusion, and aggression, and egg laying in females. The frustration can lead to plucking and screaming. It's good to get out of the habit of stroking him anywhere but the head. Keep trying fruits and veggies. I stay away from spinach because of the iron, but many do feed it. Being gone all day is not ideal, but it is the reality for most. Interact as much as possible before and after work. It's harder to do in the short days of winter. It will be easier once summer comes. The squawk is called a contact call. He makes noise and wants you to make it back, so he knows where you are. He probably is mimicking a kissing sound. It's one of the first things birds imitate. Puberty problems are probably better answered by others. But it involves him being more stubborn and maybe louder, and beakier. It's the time that a bird would leave his parents in the wild. He will still be with you, so it causes some bumps in the road for a while. cmedina2997 wrote: OK I am almost positive that my guy is a pineapple green cheek hybrid. He looks exactly like the pictures of them and I remember the salesman saying he was a pineapple hybrid conure. 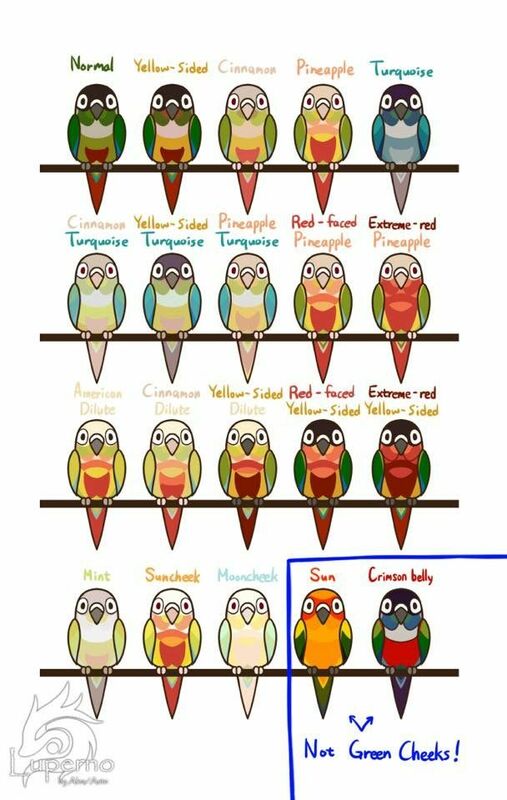 Okay, A pineapple Greencheek Conure is not a hybrid, but a mutation of a greencheek. There are many mutations, but Cinnamon and Pineapple seem to be the most common. All the mutations will behave like a greencheek. OK great, thanks very much for the info! I will stop petting him under the wings for sure! I also found an avian vet today and made his check up appt so am looking forward to getting him looked at. Between my husband and I he gets interaction and/or holding on weekdays from 4am-8am, then from 5pm-9 or 9:30pm. Then on weekends we will be home most of the day. I hope this is good for him. So far he seems ok when I get home from work. Welcome to the forum and sorry I had not answered before! No, unfortunately, that schedule is not good for any bird and I'll tell you why. Birds are photoperiodic (a long word that means that their endocrine system is governed by the length of lighthours) and need exposure to dawn and dusk to set their internal clock attuned to the seasons. It's the different light (you know, that rosie/orangey/golden light that happens at sunrise and sunset) that happens at twilight that turns on or off their 'internal clock' (circadian cycle which, in turn, governs the circannual one). When a bird is exposed to long days all year round, their endocrine system goes whacko. One of the consequences of this (there are more) is that they produce sexual hormones all year round, year after year (something that NEVER happens in nature). Birds are not like mammals, they don't produce sexual hormones all year round starting when they develop sexually and stopping when they reach a certain age. They only produce them during breeding season and, when this is over, they stop - only to start again, in the next breeding season. When they are 'resting', their gonads (sexual organs) become inactive, they shrink and go dormant. When they are in breeding season, their organs start to grow and prepare for reproduction BUT if their endocrine system is out of tune with the seasons, these organs continue growing when they should stop and become so large they start displacing other internal organs (birds don't have, like male mammals do, external sexual organs) causing first discomfort and, eventually, chronic pain. This discomfort/pain added to the sexual frustration (the birds are intensely horny but can't relieve it) is what makes them scream and bite. See the problem? GCC's, on top of this, have another problem: they are extremely needy. These little birds need hours and hours and hours of one-on-one, much more than other species. And, if you add the sexual frustration to not enough time with their chosen human, you end up with a bird that screams and bites. And this is why GCCs are considered nippy and loud when, in reality, they are not. I have only one female now but had four GCCs total (the other three were rehabilitated and adopted out, a single male and a pair that bonded in my house) and they had all been given up because of bites and one of them because of constant loud screams. All of them stopped biting and screaming once they were under a solar light schedule, the right diet and had plenty of out of cage and one-on-one time. Codee, the female I now have, is the easiest bird I have in the house. She is a great eater and bather (bathes almost every morning), she is super affectionate (first thing she does when she climbs on my finger is quickly run up my arm to give me a kiss on my cheek -every single morning! ), never screams (well, she does when it's time for her dinner ) and never bites (so much so that she is one of the two birds that I allow my grandchildren to handle). But this is a bird that gets a fresh food diet with large portions of fruit every day, which is kept at a STRICT solar schedule, which has a mate she loves (he is an old, handicapped, wild-caught ex-breeder peach front conure) and which spends a solid two hours in the morning on me every single day. Parrots are not easy pets to keep. I have dogs, cats and birds and would much rather have 20 dogs and 20 cats than two parrots because I can buy good commercial dog and cat food while I have to shop in three different stores and cook for the birds. But the worst is the solar schedule and their need for my company - I can't go anywhere in the morning because I need to spend time with the birds, I can't invite anybody to dinner unless it's during the summer because the birds in the living room and dining room cannot be exposed to light or loud/unfamiliar noises once the sun sets and I can't go with my husband on vacations unless I make prior arrangements. In March, we will have an important anniversary coming up and we are planning on going somewhere for a weekend and I am already making arrangements for this because I need a person to come in and stay in my house (paying, of course), the daughter that lives nearby needs to come in every day and check on the birds and I have to leave all the food prepared, labeled with their names and in baggies in the fridge which will take me an entire afternoon to do. And this is for two measly days! n May or June, I am going back home to meet two grandchildren that have been born since I last went (alone, of course, because my husband needs to stay behind to watch over my birds - he will be going later in the year) and, even though it's a trip of about 16 hours (utterly exhausting! ), I am only going to stay for a week or 10 days max because I can't leave my birds for longer than that. When people say they are slaves to their birds they are not exaggerating one single bit!